This is the place for shipmates' biographical sketches and status reports (photos welcome). Let's read about your situation, life experiences, comings and goings, offspring, the day the motorhome blew over and other interesting stuff! Send to nvsoar. Click on the picture for a larger image. 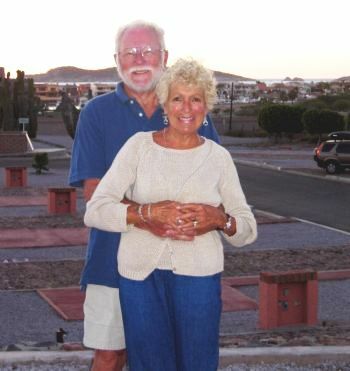 It has come to my attention that Al and Mary Lou (BB) Hall enjoy their winters in Mexico. A report from Fred Van Leeuwen: I'm now the County Veterans Service Officer for Clay County Florida. Clay is the southern neighbor of Jacksonville. I'll hang onto the VP-2 65-67 cruise books. I've found they can be useful, even after all these years, for substantiating a claim with the VA. For instance, I've used a cruise book photo of a guy standing in front of the Saigon Enlisted Mess Open, to prove "feet on the ground" experience to support Agent Orange exposure for a prostate cancer claim. Mostly, I would imagine, guys would just be interested in getting a crew photo, or one of the maintenance shop guys. If ever I can assist a Neptune's Raider, I'll certainly do it. My daytime phone number here in the Veterans Service office is (904) 269-6326. VP-2 was my first squadron. arrived there a PRAN straight from boot camp and A school, and left 3 years later a PR2. VP-2 got me started on the right foot evidently, as I stayed in the Navy, made CPO, the retired as an LDO LCDR. I have mostly fond memories of Whidbey, except for the mid to 4 ramp security watches in January. My first reenlistment was for the then new AW school. I wanted to fly! On completion of AW "A" school I got orders to a helicopter outfit at Quonset Point. (No....wait....There's been some kind on mistake!! !, I'm supposed to go to a VP squadron!!!) Never saw another VP squadron. Did nothing but Helo's and ships company tours the rest of my 26 years. No regrets. In fact I doubt I'd have done as well professionally had I stayed in VP. It was easy to be a "star" in a helo squadron. In any case, I loved it. I'm still married to my high school sweetheart. She was there at Whidbey with me, and has been the glue that kept me on track and focused on the important things in life. A report from Bill Haeckler: Up to this point in time, Pam and I are both doing OK. We went by AMTRAK from Portland to Pittsburgh in September for my 50th high school reunion. What a blast! I wouldn't recommend AMTRAK, however, as we didn't sleep for 3 nights and the service was marginal; in some cases terrible. We rented a car for a couple of weeks and visited relatives on the east coast. On the way back home, we stayed overnight with the Gullivers. Wish we would have had more time with them. Dave Bowen reports on a shipmate. War II Veterans Committee, held in Alexandria, VA., November 6, 7, and 8, 2003. 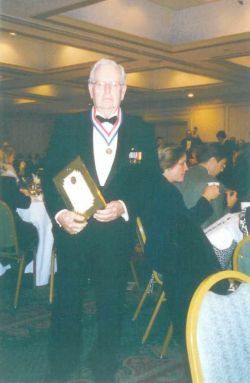 He and his son were flown there where he was honored and awarded the Chester Nimitz Award for distinguished service in the U.S.Navy during World War II. 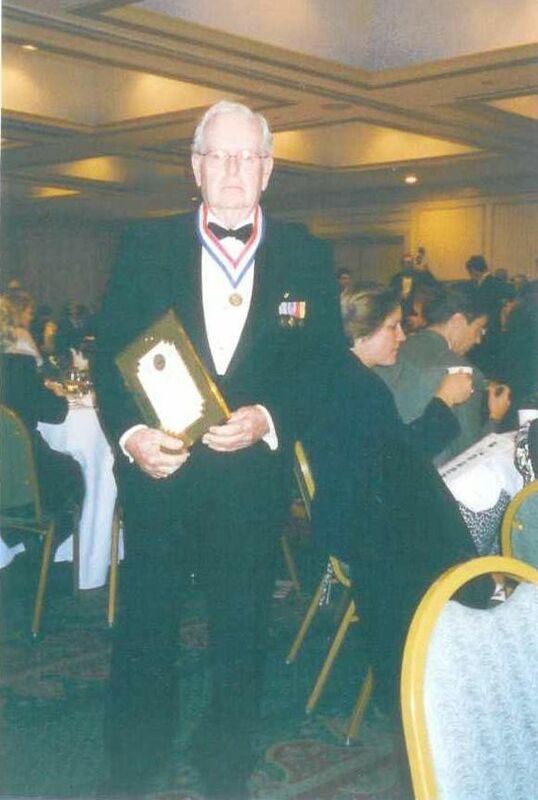 I quote from the program, "Harry Ferrier enlisted as an Apprentice Seaman on January 28, 1941. He would be the only enlisted aircrewman of VT-8 to survive the Battle of Midway on June 4, 1942. 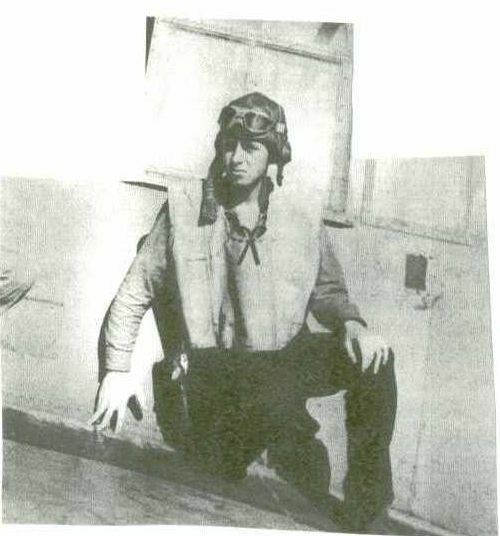 In 1943 he was assigned to Bombing Squadron Five, USS Yorktown, CV-10 for his second combat tour in World War II, flying SBD-5 Dauntless Dive Bombers. He would later rise to the rank of Commander and be decorated with the Distinguished Flying Cross, Purple Heart, Air Medal (three awards), and four Presidential Unit Citations." Harry's story was the feature article in the 8th issue (summer/fall 2002) of GHOST WINGS (www.ghostwings.com), an outstanding magazine "HONORING the SACRIFICES of AMERICA'S VETERANS". You can read the whole incredible story there about Harry and his pilot, ENS. Albert Earnest (CAPT. ), how the battle evolved and how they landed their badly damaged TBM back on Midway Island. Their third crewmember had been killed in action. [Vic "Sleuth" Gulliver has been prowling internet resources to find VP2 shipmates. This note from Bill Tatro is one of the success stories.] 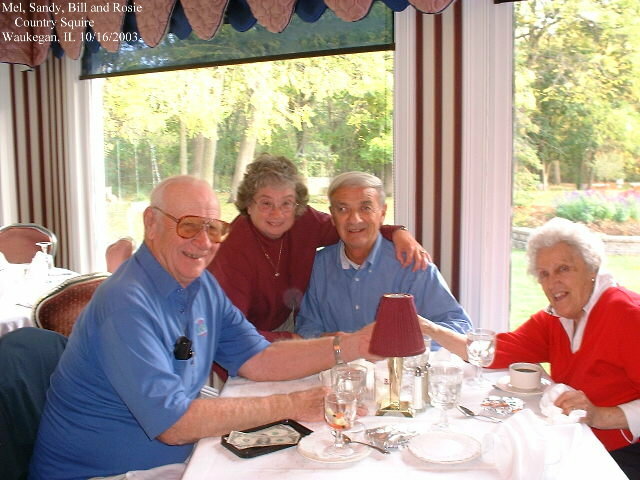 From Bill Tatro: It was a great surprise when I received your (Vic's) letter. As I told Doug over the phone, I don't know how the letter got to me. Lynnie & I have lived out in the woods for the last 19 years and have never had the Scotland Road address. Until 2 years ago, we had a Rural Route address and that was changed when we received a real street name and number. I'm glad that our letter carrier recognized our name and knew where we live. I had no idea that VP 2 had an association with so many old familiar names from forty years ago. We left Whidbey Island in January, 1962 and did not go back until May, 2002. We were amazed at the change in Oak Harbor. We were not allowed onto the base, but did see it from the hill next to the chiefs club. Being there brought back some fine memories, except for the 2 deployments to Kodiak. I think the Gullivers lived across the street from Lynnie and me. We lived in the same building as Jimmy & Betsy Pugh. The buildings have been remodeled and even the street names and numbers changed. We finally found the time, after we retired, to make the trek back to where we first began our married life. We forgot how beautiful that part of the country was and still is. After we left VP-2, I was in the reserves there at NAS Glenview and then 2 years later went back on active duty for 3 additional years. I was a flight instructor at Whiting Field, in Milton, FL and was in the same squadron as Wayne Lamer. The only other ex VP-2 people that I have run into are Ernie Hand and Joe Gleason. That was back in the 70's in Miami, FL. I worked for about 4.5 years over a 7 year period as a pilot-flight engineer for two different airlines - Braniff International and Pan Am. There isn't much security when you are on the bottom of the seniority list. Both airlines have gone bankrupt. I decided it was time to move on. I started my own chrome plating shop and worked at that for 26 years, until someone walked in and wanted to buy our business. I still go in and do their accounting and tax work about 2 times per month. Selling the business is like watching your daughter get married and going out on her own. You want her to be happy and successful, but are glad she is not your responsibility anymore. Lynnie & I have enjoyed our retirement immensely. We do go over to Pensacola about once a year and go thru the aviation museum. We live about 200 miles east of the there, just next to Tallahassee. From Will Smith. I left VP2 in 1959 and returned to my home state of Illinois. 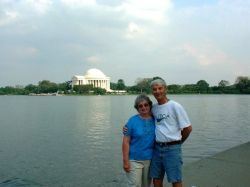 Met my wife at the University of Illinois and graduated from the U of I in 1965. We moved to Rockford, IL that same year and raised 3 daughters and a son. We have 8 grand children and still reside in Rockford. In September, Sandra and I were privileged to make a trip to Washington DC. From Max Branscomb. Reading the notices on the VP-2 web site has been great. I’d like to read about everyone’s activities after surviving their Navy experiences. I’ll throw out a couple of things so maybe others will do the same. I joined the Navy to fly so, when I got out of the Navy, it was probably natural to continue to want to fly. At that time, airlines wouldn’t hire anyone over 35 years old so I started working in a totally non-aviation industry. To keep a hand in flying, I helped my son start a homebuilt plane in our garage while he was still in high school. It is a Long EZ, fiberglass and foam creation that took nearly three years to build. 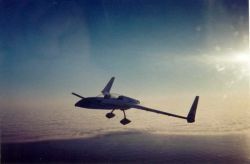 My son and I have flown it close to 3,000 hours since we finished it in 1985. I justify spending the money and time on the plane because my son flew it down to San Jose to college everyday where he got an engineering degree and he is a Captain for American Airlines today. 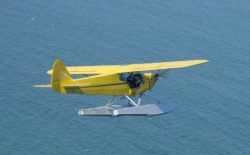 In addition to the Long EZ, we stumbled into ownership of a J-3, Piper Cub. 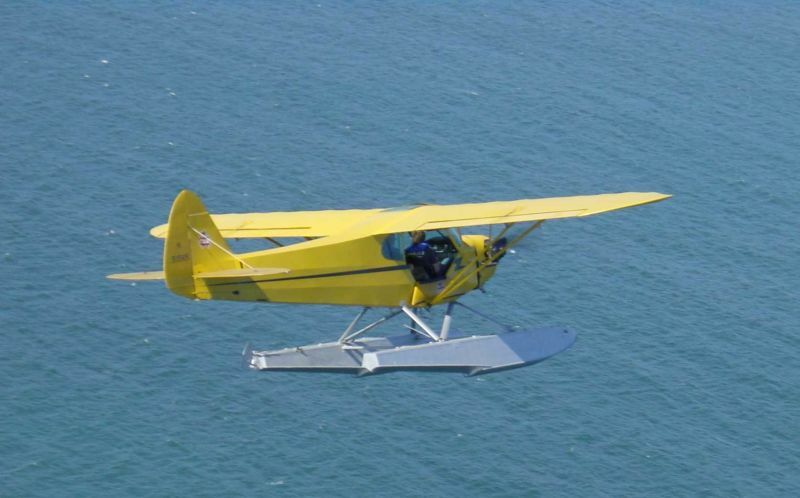 Piper Cubs aren’t the most exciting things to fly so we put it on floats and fly it around the San Francisco Bay area. Again, the excitement factor is pretty mellow, but it is a kick to land in the Bay and taxi into McCovy Cove at the new PacBell Baseball Park. I’m sure many of you have done really exciting things, so let your senior citizen shipmates know what you’ve been doing.